Notes: Whilst in Norway to film his part in Cilla`s TV show, Ringo also briefly filmed a cameo for a Norwegian telethon. 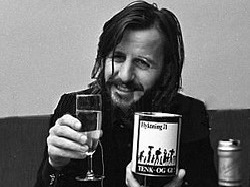 Ringo reportedly held up a fundraising tin along with a glass of wine and instead of saying the slogan "Think...and give", Ringo instead said "Drink...and give". The telethon was part of an United Nations campaign for the "Year of International Support for Refugees" with the Norwegian title of "Flyktning `71". Unfortunately this brief bit of footage has never turned up anywhere but thankfully we do have a photograph.